I finally found time to cash in on one of my Google+ invites after taking a much needed vacation. My initial assessment? Google has actually figured out how humans work, so mark Google+ as one to watch and ignore the pundits that are telling you it's no threat to Facebook. The real threat from Google is they have finally shown evidence that they understand social and human beings by association. The whole Google+ experience while far from perfect offers proof of this—specifically with its "circles" feature. 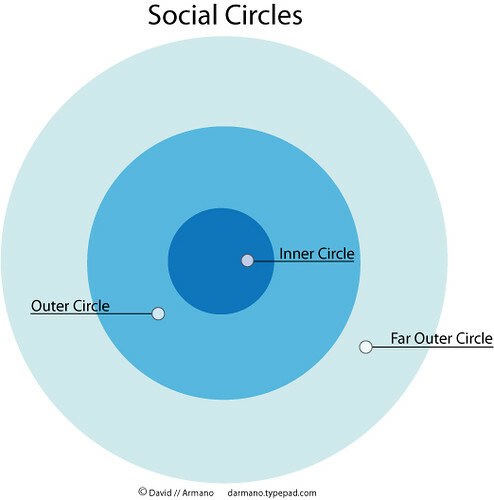 Much like the diagram above I did several years ago, Google+ offers participants to the network "circles" where they can categorize their connections ranging from friends, to family, acquaintances, public etc. To many users of various social networks, this comes as welcome addition to those managing multiple spheres of connections and wish to interact with them differently vs. using a broad brush for everything. Google+ has tons of potential despite the saturation of social networks out there for one reason. They're Google. And search is complimentary to social. When they connect these two pieces together (and they will) look out.